Unlike many businesses, most schools don’t have a lot of money to be throwing about. They must be careful about what they choose to buy and invest in. 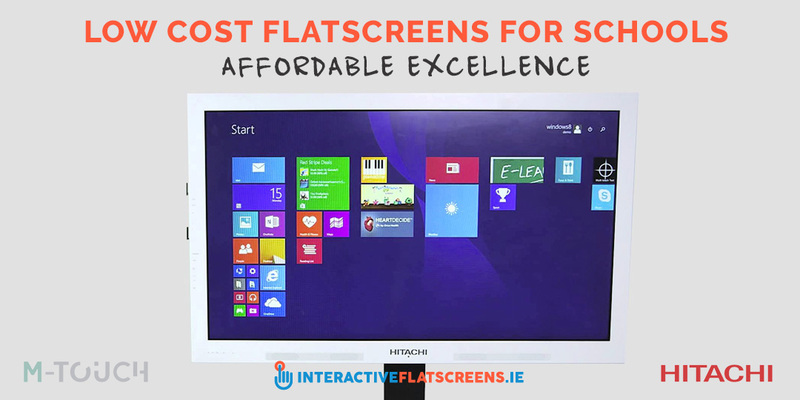 If you are running a school and you are interested in buying an interactive flatscreen, there are a couple of affordable options for you. The Hitachi HIT-FHD6516 Touch and the M-Touch 4k touch screen monitors are both high performing but less expensive screens than the Clevertouch range of flatscreens. Here at IFS.ie, we only deal in quality technology that will perform well and last long. That is why, if you buy from us, you can expect that the product will deliver. 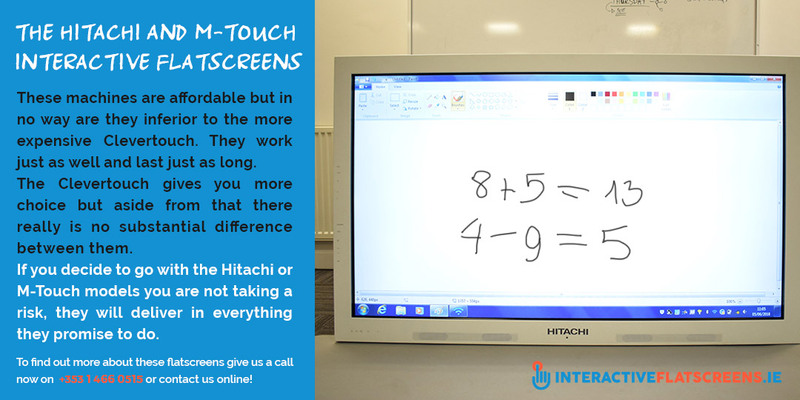 These two screens from Hitachi & M-Touch may be less expensive than the Clevertouch, but they are durable and of a very high calibre. You can be confident that they will perform just as well as the Clevertouch. There are many specs to each of these touch screens but instead of getting bogged down in the details let’s just say that they do pretty much everything the Clevertouch does: a complete, immersive, collaborative learning environment. An all-in-one interactive flatscreen for schools that is easy to use, enables simple installation and is designed for thousands of hours of use. These machines are completely revolutionising and transforming learning environments across the country. Collaborative and interactive learning has never been easier. Over recent years, the technology has advanced to the point where it can now do pretty much anything the learning environment demands of it. Nowhere else in society is ICT making such a difference, and such an important difference it is, than in the classroom (and in the PE Class!). Schools around the country are embracing this technology. You can do so too without breaking the bank, by investing in one of our affordable models: the Hitachi HIT-FHD6516 Touch and the M-Touch 65 interactive panel displays. These machines are affordable but in no way are they inferior to the more expensive Clevertouch. They work just as well and last just as long. The Clevertouch gives you more choice and access to the Cleverstore range of educational apps but aside from that there really is no substantial difference between them. If you decide to go with the Hitachi or M-Touch models you are not taking a risk, they will deliver in everything they promise to do. We’ve been dealing in interactive flatscreens for a long time now and we know what the best brands are and why they are the best. 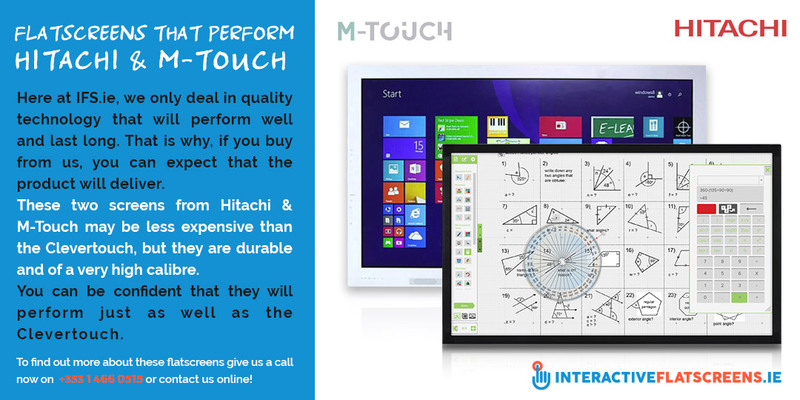 We say the Hitachi and M-Touch panels are amongst the best. They are fantastically priced screens that will not let you down. You can trust us on that. We supply these powerful machines to schools across Ireland and it is a job that we don’t take lightly. If you like the sound of this, give us a call on +353 1 466 0515 or contact us online and we can talk some more about transforming your learning environment with an interactive flat screen that you can afford.